Individuals from the Friends of Glen Providence Park attended the second public meeting for Delaware County’s Open Space Plan on Tuesday March 12, 2013. Delaware County Planning recently posted the meeting’s presentation files on its website, giving those who did not attend the Public Forum the opportunity to review and comment on the long range concept plans for six County parks, including Glen Providence Park. Public feedback is an important element in the Open Space Plan process, and County Planning, County Parks & Recreation, and the consultants are thoughtfully considering comments and feedback. There is a significant change proposed for the Glen Providence Park pond and Broomall’s Run, outlined below- please take the time to review the Concept Sketch for Glen Providence Park, and provide your feedback to County Planning. While there is no specific deadline, we recommend replying no later than Friday, May 3. We have included a guide and links to the three sections of the presentation that are posted on the County website. If you have any comments, ideas, or suggestions regarding the County parks plans, please email them to Senior Planner, Steven R. Beckley, AICP at BeckleyS@co.delaware.pa.us, or print and fill out the evaluation form used at the Forum and return it to the address, fax, or e-mail listed at the bottom. – Timing & Objectives: the list of objectives is thoughtful and excellent. There are additional Public Meetings planned for Fall 2013 and January 2014 to review Final Drawings and Draft Recommendations, then a Final Public Meeting to present the Plan. – Needs Assessment, Survey Findings, Values & Philosophy, The Big Picture and Trends: All of the public feedback so far emphasizes the need to preserve natural open spaces in Delaware County, and prioritizes passive use such as hiking trails. – Divert Broomall’s Run through the pond: This is proposed to address ecological and erosion problems at the pond, as we outlined in Upcoming Changes: Pond & Wetlands. Would you want to see the stream adjacent to the pond filled in, and relocated to run through the pond? Do you have any environmental expertise to know whether this would be helpful or harmful to the pond and stream ecology? – Additional parking lot built at Kirk Lane: Have you ever found the Kirk Lane parking lot to be full? Do you see a need for more parking spaces? What do you think of the proposed location? – ADA accessible terrace below the main entrance overlook: Do you feel this would be used? Do you think it would positively or negatively impact the main entrance? – Children’s Natural Play Area, using natural materials to make features such as stepping stones, walkways, and balance beams near the picnic pavilion: How do your children use the park? Is this a feature you would like to see, or that your children would use? * May 2, 2013 Update: Please see the comments below for an explanation of why we do not support the first two proposals. – They are considering our idea to re-establish the Eleanor Reed Butler Waterfall as a recirculating waterfall from the pond! Please make any specific comments on County Planning’s evaluation form, and reply to Steven R. Beckley by email, mail, fax or phone. “The two most significant changes proposed are to divert Broomall’s Run through the pond, and to build an additional parking lot on Kirk Lane. Based on what we have learned, we do not support either of these proposals. 1) While something does need to be done to address ecological and erosion problems at the pond, as an environmental scientist who has studied the pond for years told us, “A pond is a pond for a reason. Running a creek through it changes the entire makeup of the body of water and converts it back to a creek.” It is our understanding that the proposal would be detrimental to stream organisms such as crayfish in Broomalls Run, and to pond organisms such as frogs, turtles and fish. 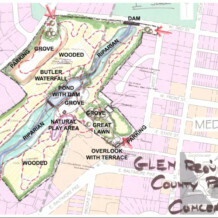 The extensive construction to fill in and divert Broomall’s Run would damage the surrounding area, and a dam would need to be constructed and maintained. We think much gentler options should be implemented to address the erosion problems, including regulating the water flow into and out of the pond, and extensive planting of appropriate erosion-controlling native plants along the pond and stream.